Sizing beams is one of the repetitive tasks involved in structural design. We wrote this Excel macro to make this analysis task faster and more accurate. 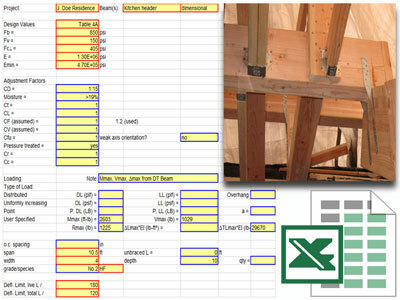 The macro can be used for dimensional lumber, rough-sawn lumber, or glulam beams. It can be used to size new beams or check that existing beams are adequate for various loading conditions. Calculations are based on the National Design Specification (NDS) for Wood Construction.